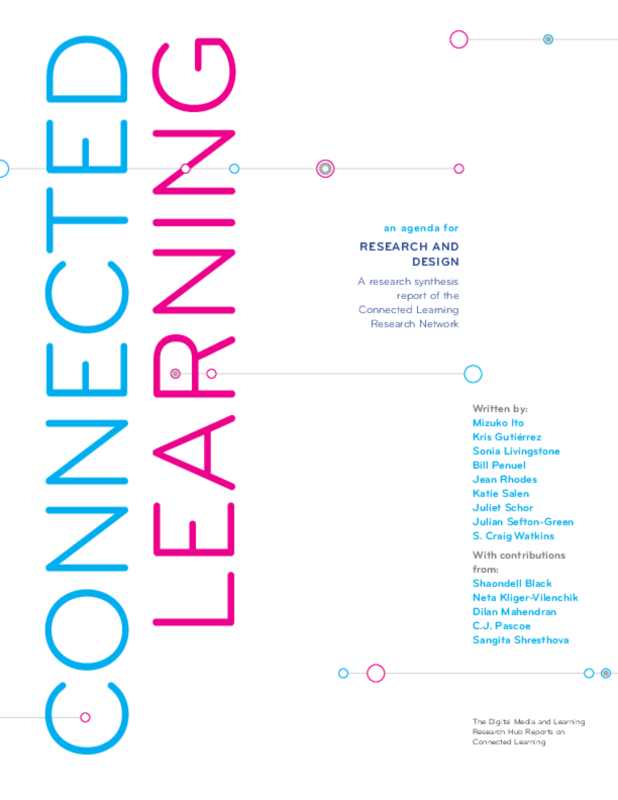 This report is a synthesis of ongoing research, design, and implementation of an approach to education called "connected learning." It advocates for broadened access to learning that is socially embedded, interest-driven, and oriented toward educational, economic, or political opportunity. Connected learning is realized when a young person is able to pursue a personal interest or passion with the support of friends and caring adults, and is in turn able to link this learning and interest to academic achievement, career success or civic engagement. This model is based on evidence that the most resilient, adaptive, and effective learning involves individual interest as well as social support to overcome adversity and provide recognition. This report investigates how we can use new media to foster the growth and sustenance of environments that support connected learning in a broad-based and equitable way. This report also offers a design and reform agenda, grounded in a rich understanding of child development and learning, to promote and test connected learning theories. We begin with an analysis of current economic, social, and technical trends that frame the educational challenges faced by many countries, especially in the Global North -- including the contraction of economic opportunity, growing inequity in access to educational and economic opportunity, and the risks and opportunities of media engagement. Connected learning addresses the gap between in-school and out-of-school learning, intergenerational disconnects, and new equity gaps arising from the privatization of learning. In doing so, connected learning taps the opportunities provided by digital media to more easily link home, school, community and peer contexts of learning; support peer and intergenerational connections based on shared interests; and create more connections with non-dominant youth, drawing from capacities of diverse communities. We also offer an approach to learning, design and program building that can expand the opportunities afforded by a changing media environment while minimizing the risks. Our approach draws on sociocultural learning theory in valuing learning that is embedded within meaningful practices and supportive relationships, and that recognizes diverse pathways and forms of knowledge and expertise. Our design model builds on this approach by focusing on supports and mechanisms for building environments that connect learning across the spheres of interests, peer culture, and academic life. We propose a set of design features that help build shared purpose, opportunities for production, and openly networked resources and infrastructure.